Submitted by Mary Serr on Thu, 06/07/2012 - 14:07. It’s early June and the first rainy weekend in nearly a month. In the brightly lit stand at Marshall Farms, the morning’s offerings are already set out: asparagus and strawberries, tomatoes and garden peas, zucchini and summer squash, green beans and flowers. Rick, 50, manages the Harrington Avenue farm full-time. His father, Rickie, 71, is retired but helps out. “Retired means he only works 40 to 50 hours a week now,” jokes Rick’s wife, Nancy. “Richie’s idea of retirement isn’t like most people’s.” Nancy works in the field and the store on weekends. The younger generation is also part of the operation: Ricky, 29, does general work and “fixes” (he trained as an electrician), while Jackie, 30, runs the farm stand. The farm is especially well-known for its tomatoes, which it grows in 25 varieties, many of them heirlooms. This summer marks the second year the Marshall family are tenant farmers. In September 2010 the town of Concord agreed to purchase the Marshalls’ last 1.8 acres as part of a deal to keep the land in agricultural production and the family in place. The deal came after several years of talks between the Marshalls and town manager Chris Whelan. It’s an arrangement that has recently come into favor in suburban Massachusetts as farmers and state and local officials look to ways to preserve prime agricultural land and a productive way of life. For many years Rickie Marshall had withstood development pressures. Farmland all over west suburban Boston was being sold and sprouting subdivisions. He remembers a steady stream of developers ringing his doorbell, asking if he was interested in selling. But even though the money developers offered was enticing, he couldn’t do it. “My father bought this house in 1939,” Rickie said. “As a kid, I started picking (berries) for a neighbor. I was raised as a farm kid. Back then a lot of us in West Concord were farm kids… “ Rickie added that his father had opened a food store in West Concord in the 1940s, right across from the current West Concord Supermarket. In 1970 Rickie and his late wife Diane established the farm, growing only tomatoes. In 1982 Rickie bought out a partner and expanded his operation. In 1988, Rickie and Diane opened the farm stand for retail sales. After Diane’s death in 2009, some in the community worried that the farm would go the way of other area farms and close. However, Rickie had a family that enjoyed the farm lifestyle and wanted to continue. Looking to the immediate future, Nancy sees continuing strong business. “We have a following. There are families that come here regularly in the summer, and then come every year at Christmas. “ She said that flowers have become an increasingly big draw at the stand. “We used to sometimes have to bring in flowers from other farms, but people knew that and said that they wanted our flowers.” Sunflowers are the biggest seller, followed by zinnias and snapdragons. In the winter, the Marshalls do a brisk business in firewood, as well as seasonal decorations (wreaths, kissing balls) and Christmas trees. 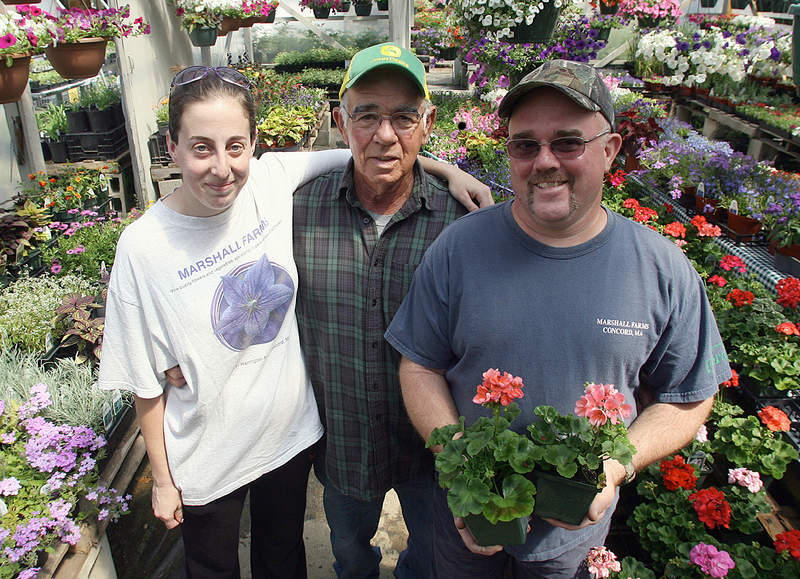 The farm stand is located at 171 Harrington Avenue, off Route 62, and is open seven days a week. Hours are 9 am to 6 pm. This super-quick late-spring or early-summer vegetable ragout (or, if you're feeling less fancy, stew) is itself extremely light. Serve it on steaming polenta to turn it into a satisfying main dish. The key to this ragout is to use very tiny carrot and zucchini. Ideally, you would only need to quarter them lengthwise to get "bite-size" pieces. Larger specimens will work just fine, but the ragout will have a less refined air and it will involve a bit more prep work as you cut the vegetable to the right size. Shell peas and set aside. Cut carrots and zucchini into quarters lengthwise and set aside. Cut green onions into 2-inch lengths, quarter lengthwise and set aside. Slice garlic as thinly as possible. In a medium sauce pan over medium-high heat cook garlic in olive oil until fragrant, about 1 minute. Add carrots, green onions, salt, and 1/2 cup water. Cover and cook until onions soften, about 3 minutes. Add zucchini, cover, and cook until it softens, about 3 minutes. Add peas, cover, and cook until everything is tender, 2 to 3 minutes. Stir in mint and thyme. Serve hot or warm, over polenta, if you like.